This is what I call a Yacht! This little sucker, the Pelorus, belongs to 39-year-old Roman Abramowich. he is in Lübeck for the World Championship. His chopper will fly him to all the games from here. 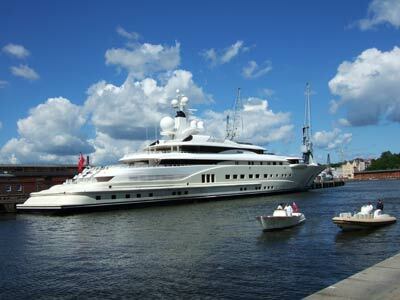 The boat is the 5th biggest motor yacht in the world. This one is 115 m (377,3 ft) long. 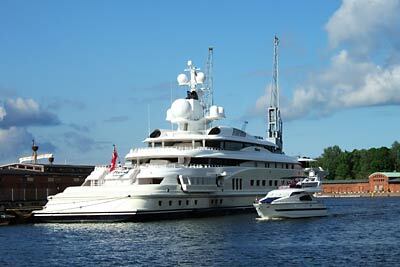 The guy owns also the 86 meter Ecstasea and the 108,30 meter Le Grand Bleu (the 6th biggest). Author Marc HastenteufelPosted on June 4, 2006 March 14, 2015 Categories Europe, Interesting Facts, Lübeck, TravelTags Europe, Germany, Interesting Facts, Lübeck, TravelLeave a comment on This is what I call a Yacht!